This is a strategy I picked up years ago. I can’t even remember where I read/learned about it. I just know it works so it has become a good habit of mine. “Touch Things Once”. That means don’t set things aside to put them up later. Put them up now. Scenario one: You grab the mail on the way in from running errands. You throw them on the kitchen table to go through later. When suppertime comes, the mail is moved to a kitchen countertop. Someone throws library books on top of them. The library books are due and hastily grabbed to bring them back to the library. The mail is accidentally grabbed along with the stack. You throw everything in the car. Someone notices that there is mail with the library books. The library books are returned. The mail gets left in the backseat of the car. The electricity bill doesn’t get paid. You are left blinking in the dark. You have to pay a fee to get your electricity back on. Scenario two: You grab the mail on the way in from running errands. Mail has to be judged worthy to get into my house. You stand at the trash can in the garage and immediately toss out the junk mail. You open up the bills and throw away the junk mail in the bills. You put the bills in the bill spot. The bill gets paid. You are a hero. Scenario one: You finished eating supper. You pick up your dish and put it in the sink. The sink becomes overflowing and you need to use the sink, so you put it on the counter.Then you need to use the counter, so the dish gets shoved into the sink again. Someone yells that there are no dishes and it finally gets loaded into the dishwasher. Of course the dishwasher doesn’t get started and someone else yells that there are STILL no clean dishes. The dishwasher is finally started but by that time there is a huge backlog of more dirty dishes. Don’t pretend like this never happened to you. 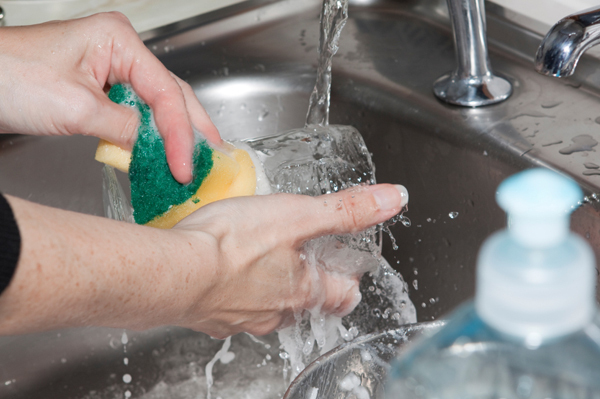 You probably have a sink full of dirty dishes right now! Scenario two: You finished eating supper. You pick up your dish and put it straight into the dishwasher which is started after the meal is done. Cue angelic music. Scenario one: You pull the clean clothes out of the dryer and put them on the sofa. You are going to do laundry while you watch T.V. Oh, you are so efficient. The doorbell rings. You grab all the clean clothes and throw them on the floor of your bedroom and quickly shut the door. It is your nosy neighbor who stays way too long talking about absolutely nothing. You forget about your efficient plan of folding clothes. Night comes and you stumble into your room and discover the pile of wrinkled clothing. You are too tired to worry about it now. You wake up the next day and try and choose something from the top of the pile that isn’t too wrinkled. You throw everything back into the dryer to get the wrinkles out and throw them back onto the sofa. The doorbell rings. You know this is you. Scenario two: You stand at the dryer and fold and hang the clothes directly from the dryer. The doorbell rings. You close the dryer. It’s your nosy neighbor who stays way too long talking about absolutely nothing. You excuse yourself for a moment and turn the dryer on fluff. The buzzer goes off and you say you must get back to the clothes. The neighbor leaves. You smile and get back to folding clothes. Everyone has wrinkle free clothes. Your husband looks so great in his wrinkle free clothes that he gets a huge raise. Well, OK… I may be stretching it a bit here… but it COULD happen. The second scenarios result in peace. It is a simple thing but produces so much. I had to walk around telling myself “Touch Things Once” for several weeks before I got the habit down. This entry was posted in Efficiency Strategy, How to be more efficient, Touch Things Once. Bookmark the permalink.